The Fish Vet’s veterinary services – integrated innovative solutions. In veterinary health care, there may be service boundaries defined by providers’ clinical specialties. The results will be fragmented, inconvenient, inefficient and the outcomes compromised for the solutions you needed yesterday. The Fish Vet’s services are designed to achieve excellent outcomes for clients with customised needs. Most veterinarians have expertise in single fields. Dr Loh is unique in that he is one of only two veterinarians globally who has post-graduate, Membership qualifications in aquatic animal health and in veterinary pathology, admitted by examination to the Australian and NZ College of Veterinary Scientists. He also holds a research Masters degree. This means that he can solve your problems in the field or laboratory, and can devise strategies for research if the problems are more complex. Dr Loh is affiliated with many world class organisations, serving as the Secretary of the Aquatic Animal Health Chapter of the Australian and New Zealand College of Veterinary Scientists, President-elect of the World Aquatic Veterinary Medical Association, a Senior Adjunct Lecturer at Murdoch University’s Veterinary and Biomedical Sciences section and a past Treasurer for the Australian Society of Veterinary Pathologists. He is also a member of the International Association for Aquatic Animal Medicine and a member of the European Association of Fish Pathologists. The Fish Vet as a one-stop shop, gives the clients a personal connection to the all the veterinary services you require. The Fish Vet’s clients benefit from more convenient and better coordinated access to veterinary services and improved outcomes. 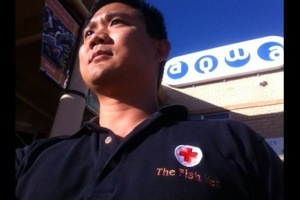 The Fish Vet operates a mobile consultancy service and so no matter where you are in Australia, Dr Loh can organise delivery of his services to your pet, your business or your farm. Previous Post Check out this flatworm from a skin scrape of a Frontosa. Do you know what it is? Next Post Thinking of using fish pedicures? Think again.